When we hear the word “slave,” we think of someone who is helpless under the power of a dominating force or inﬂuence. 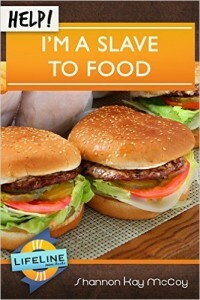 If you are a slave to food, your time and thoughts are devoted to eating it. It seems to have an irresistible power over you, and you give in to it repeatedly. You have lost all hope of ever escaping on your own. You ﬁnd yourself in a vicious cycle of dieting and overeating. But, if you look around, you know that you are not alone. You can’t go through the grocery store checkout line or watch a TV program without being bombarded by the latest diet plan that will revolutionize your life. It seems as though everyone is looking for a solution to stop overeating. Perhaps you have come to the point where you have tried everything and nothing has worked. You ﬁnd yourself locked behind the prison wall of overeating. What is the answer? The gospel of Jesus Christ. So writes, Shannon McCoy, in her very helpful little book HELP! I’m a Slave to Food. Shannon recently taught a seminar for the Institute for Biblical Counseling & Discipleship’s Summer Institute in Escondido, CA. Listen to the FREE audio download of Shannon’s seminar.